"A Boeing 777 arrives at JFK and is on its way across the tarmac, when it suddenly stops dead. All window shades are pulled down. All lights are out. All communication channels have gone quiet. Crews on the ground are lost for answers, but an alert goes out to the CDC. Dr. Eph Goodweather, head of their Canary project, a rapid-response team that investigates biological threats, gets the call and boards the plane. What he finds makes his blood run cold. So begins a battle of mammoth proportions as the vampiric virus that has infected New York begins to spill out into the streets. Eph, who is joined by Setrakian and a motley crew of fighters, must now find a way to stop the contagion and save his city--a city that includes his wife and son--before it is too late." What a great trilogy. 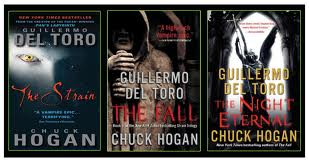 I got curious about these books after seeing the TV Show "The Strain" in the FX Channel. I got really intrigued when I read that the series was based a book with the same tittle. The first episode of "The Strain" totally freaked me out, to top things out the series airs Sunday nights, so any noise in my house made me jumped. The following morning I told the people I work with about this series… well.. let's say that I am not the only sissy around. One of the nurses I work with could not sleep that night either. LOL. Let's get this fact out of the bag, this is a vampire book, they call them "Strigoi" in the books, but this vampires are not Erick Northman from True Blood, Count Chocula (whom I would bite), or even the cutie "Count Dracula" from Sesame Street. These are some nasty, eewwww looking, bloodsuckers Strigolis. Forget about the romance of "Twilight", you want to be very far away from these things. I could not put down these books. I wanted to know what happened to the people in the plane, where their Master, and the Ancients came from, and what's going to happen to the planet, because this was a pandemic of enormous proportions. In the same line as the zombies where infected in the World of Z movie & book. Once infected with the vampire virus the only way out of this is by being decapitated or burn in daylight (crosses, garlic, and holy water do nothing to this creatures). The explanations of this book are very detailed, from how the parasites get and transform humans into the new Strigolis, to every fight scene. The end was totally unexpected. It is a happy-sad ending trilogy, however it makes sense the way the plot was moving . I don't want to give it away. I don't want to spoil the fun of such an entertaining reading. New category in my Kindle: Scared to death.